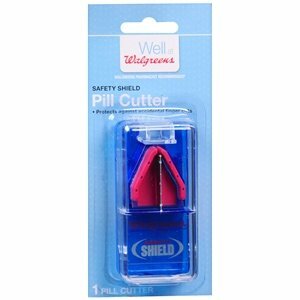 The unique design of this pill cutter provides a clean-cut pill without the danger of cutting fingers. When closed, a super sharp stainless steel blade cuts pills in half for easier swallowing. When the cutter is opened, the unique safety shield moves into place to completely cover the sharp blade so fingers cannot come in contact with it. Flexible wings hold even the largest pill for an even cut. Made in China 100% Satisfaction guaranteed with all Walgreens products or your money back. Warnings Blade is sharp. Always avoid direct contact with blade. Discard product when blade is not providing optimal performance. As with all medication devices, keep out of reach of children.